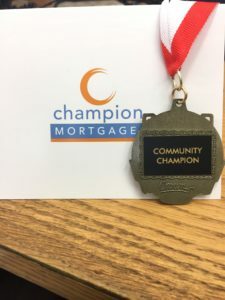 Last month I received a Champion Award from Champion Mortgage Inc. in Guelph. I had the opportunity at a Leadership Summit hosted by Intrigue Media also from Guelph to share about the exciting ministry we initiate with individuals with special needs. I had no idea this would be an outcome of my brief time of sharing my passion and this work. The award was presented to me by Doug Adlam and Matt McQuade, Professional Mortgage Managers for Champion through my son Seth Partridge of Intrigue Media. I shared with Doug and Matt in an email that I have never received an award like this before and we (Staff of Countryside Camp and Conference Centre) together as a team celebrate this recognition for our collective work and advocacy for individuals with “Special Needs!” Here is Doug’s response in an email back to me. “We truly commend the work that you and your team have done to provide affordable camps for guests with special needs. Community leaders like you and your team are what makes the world a better place to live. Those who contribute the most to our communities rarely get noticed and thanked. This is our small way of helping recognize some of the amazing people in our communities who in our opinion deserve the recognition. I have chosen to define Champion as one who advocates or fights for a cause or on behalf of someone else. I could not think of a better cause, then serving those with “Special Needs.” Thanks again to Matt and Doug for their award.